El Greco is probably one of the most well known artists of his time, and still to this day, over 500 years after his death. Because of the obscurity in his style, and the fact that he was considered a painter of the spirit, he was one of the most influential painters, which set the groundwork for many to follow, and for many art forms that followed. His work was admired by the members of the Blue Rider School, and several artists who followed, far after his career ended. 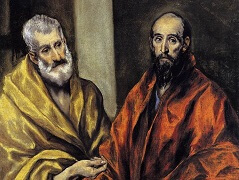 El Greco was born in Crete, and was trained as an icon painter. The non-naturalistic basis of his work showcased the talent that would follow, in the many pieces created during the course of his career. He moved to Venice in 1567, as Crete was considered a Venetian territory. At this point, he made it his goal to master the form of Renaissance painting; this included a perspective, figural style, and the ability to create and stage elaborate narratives, for the work he would create. 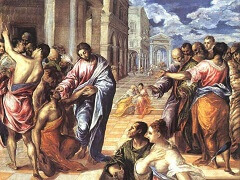 The mural of Christ healing the blind is one of the pieces that showcases this narration, and is one of his most famous art works created. He also wrote treatises about painting, and the style of work he created for the art world. Upon moving from Venice, El Greco lived and worked in Rome from 1570 to 1576. He came with a letter of recommendation from the Croatian miniaturist, and this secured him a place to stay and work while in Rome. There he set about mastering the elements of Renaissance Art, including perspective, figural construction, and the ability to stage elaborate narratives. By the time El Greco arrived in Rome, Michelangelo, Raphael and Da Vinci were dead, but their example continued to be paramount, and somewhat overwhelming for young painters. 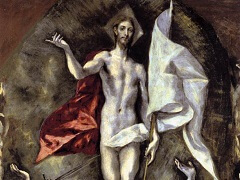 El Greco was determined to make his own mark in Rome defending his personal artistic views, ideas and style. He stayed with Alessandro Farnese, who was possibly the wealthiest and most influential patron in Rome, during this period. In 1572, El Greco joined the painter's academy, where he was known to have one or two assistants while working here. Although he did not receive the commission he was hoping for in Rome, he did receive numerous requests for portraits, and small scale devotional paintings and sculptures to be created for high end clientele. 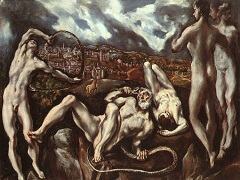 One of the reasons why El Greco was chastised in Rome, and possibly did not reach the peak of his career there, was due to the fact that he had criticized Michelangelo, and his extensive work, which was highly respected in Rome; for this reason, the work El Greco was not viewed for its full potential, and he was ostracized by many for this. 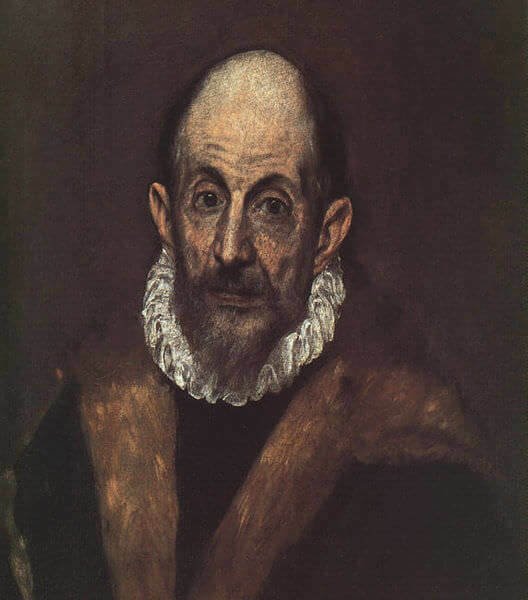 In 1576, El Greco made the move to Spain, where his first bid for royal patronage with Phillip II, failed. It was not until he moved out to Toledo, where he finally became recognized as a great artist, and the potential he had was finally being viewed by peers, and admirers in the art world. 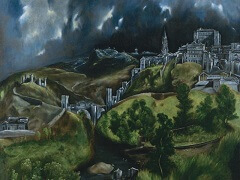 El Greco was immortalized in this city, and the piece View from Toledo was quite possibly one of his most famous pieces; in the city he found a group of friends and colleagues, and was beginning to make his mark as an artist; it was in the city of Toledo where he began making a profitable career for himself as an artist. While in Toledo, El Greco was commissioned to paint three altarpieces, by Diego de Castilla (who was the dean of the Toledo Cathedral). These pieces were to be painted for the Church of Santo Domingo el Antiguo. These were quite possibly some of the biggest masterpieces the artist created, and were the first major art works he did. They focused on a variety of styles, and unique form which he had picked up while living in Italy. Some hints of naturalism could be seen in the characters, compositional ideas which were learned by the works of Michelangelo were also present in his paintings, and there was also a mannerist emphasis, on the elegant and refined features which were noted, in the three works he was commissioned to create. 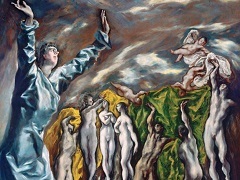 During the commission of these works, a dispute between the price that was paid, and what El Greco hoped to earn, led to litigation; this not only caused a rift between those who had befriended him in Toledo, but also left a mark on the career which followed. 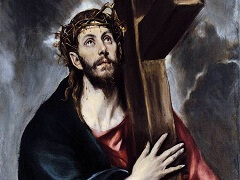 Due to this issue, El Greco never received another sizable commission from the religious authorities, and was never hired to do work on any churches for the remainder of his career. Most of the work and commissions that were received in the later part of his career, came from private individuals, as well as covenants in the city. The most famous painting which El Greco drew was The Burial of Count Orgaz, which was commissioned by the parish priest (Santo Tome), in Toledo, in 1586. It was a celebration of the financial obligation that people had to the church. The picture is meant to serve as a real world of the viewer, and the fictional world as seen through the painting. This piece is central to the understanding that the art world has to El Greco and his work in general; it captures the essence of his art, which is a visionary experience which hasn't been duplicated by any other artist. 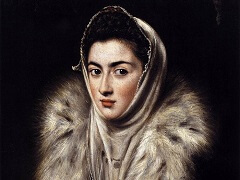 Late in his career, El Greco rejected the art form as a vehicle for his art, and embraced the self conscious style, known as maneira. 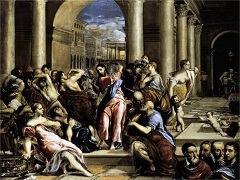 This stems from the fact that the artist took the opposite route when the style of mannerism was being rejected in Rome; while other artists were turning away from this form of art, El Greco accepted it, and worked it into his pieces. Elongated twists and forms, and unreal colors were some of the basis for his artwork.